Completed Real-Time Electrocardiogram Monitoring prototype device. Photo by Edward Sandor. An arrhythmia is an irregular heartbeat that occurs when the electrical signals controlling the heart's muscular contractions become malformed. Patients who suffer from these symptoms are often given a Holter monitor to wear, which records electrocardiogram (ECG) data. During a subsequent health care provider visit, the patient's ECG data is analyzed, and if an arrhythmia was successfully recorded, the underlying condition can be diagnosed. This project aimed to develop a wearable medical device for real-time arrhythmia detection, which acquires ECG data through a three-lead ECG sensor. It performs ECG signal processing and immediately alerts the patient's health care provider of an arrhythmia via wireless messaging. At the current stage of this project, a common form of arrhythmia known as premature ventricular contractions (PVCs) are identified using the Pan-Tompkins and the wavelet-based Template-Matching algorithms. When three or more consecutive PVCs are detected, the device sends urgent report email to a patient’s health care provider. In the experimental study, the design has been successfully validated using benchmark records from the MIT-BIH arrhythmia database. 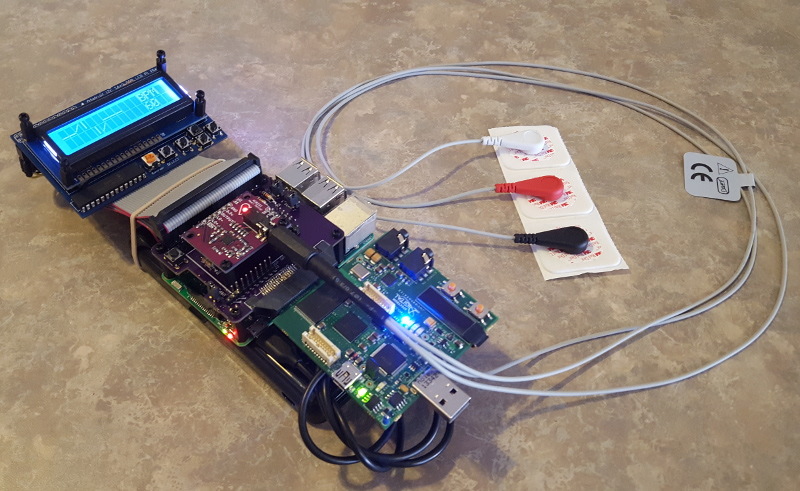 A low-cost digital signal processor evaluation kit, the Texas Instruments TMS320C5515 eZdsp USB stick, and an embedded Linux system, the Raspberry Pi 3 Model B, were chosen to be the hardware platform for this project. This study suggested a viable, low-complexity solution for real-time heart monitoring and arrhythmia detection. Bolded name denotes primary contributor.